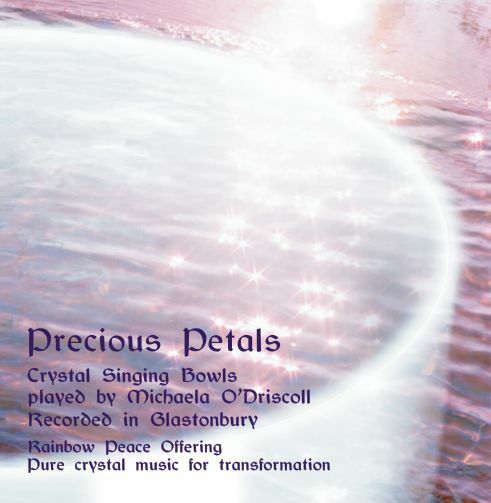 Precious Petals,, a beautiful 41 minute recording of my 14 crystal bowls, recorded in Avalon, Glastonbury., in 2001. Offerings were made when it was recorded and it is intended to promote healing, peace and connection to spirit. This CD is extremely relaxing and inspirational. Be bathed in the nurturing gentle sound dissolving, transmuting and melting away old patterns and imprints through circles of song, pure vibrations, blessings for harmony, purity and healing. Working deep on the cellular level as well as spirit. The crystal bowls are programmed or tuned for our highest healing, for forgiveness (acceptance of what is and letting go) and honouring our ancestors and our earth. Crystal sound is a powerful medium in aiding release of old patterns and negative life imprints. It can be listened to for meditation, relaxation, to play accompanying healing practises and can be very beneficial to listen to on going to sleep.